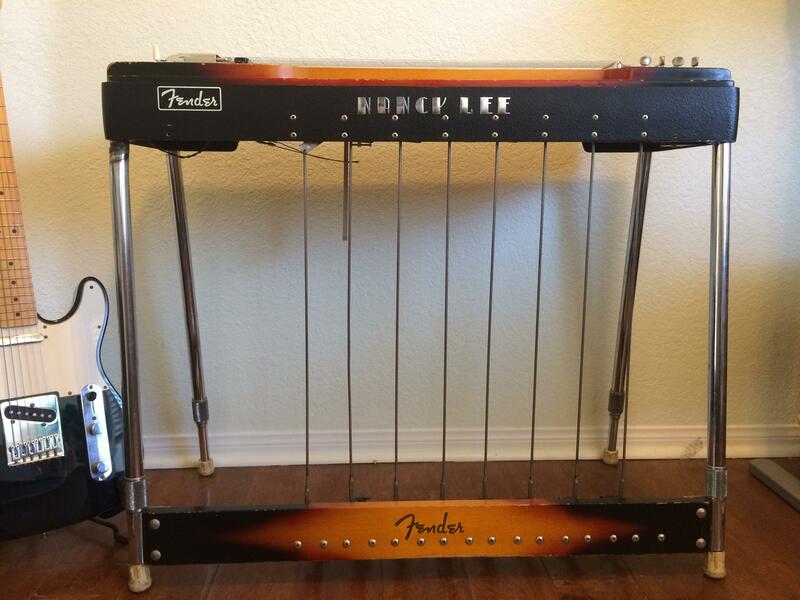 Just some notes and mods on this old Fender pedal steel. I found this on Craigslist so cheap I couldn't pass up. Best guess is this is a mid to late 60's Fender 1000. 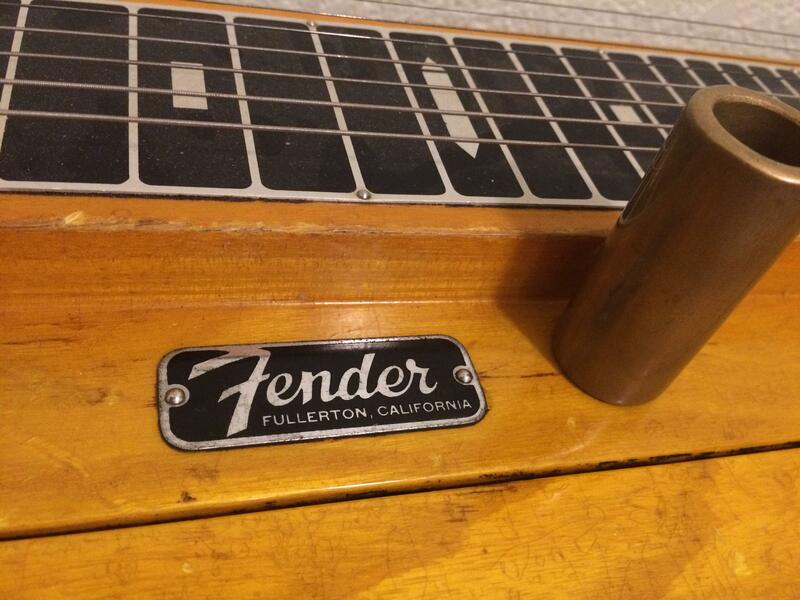 It was made by Fender in Fullerton, California. You can find a manual here (not the same year as this guitar). This guitar was owned by a woman named Nancy Lee who was a pedal steel player in the 60's and 70's. That's all I could find about her. If you know any more about her please reach out, I would like to know more. You'll hear bad things about Fender pedal steels. The main limitation is the lack of knee levers. They also are 8 strings instead of the standard 10. Beginners are usually steered away from anything that isn't the modern standard of 3 pedals and 4 levers. This is for good reason -- it's a hard instrument to get into. But aside from the pedal/steel limitations this seems to be a great instrument. It's easy to set up, robust, and sounds great. The Fender 1000 model morphed quite a bit over the years. This particular one has most or all of the late model features. The pedals are cast aluminum. The pickup is the narrower type. The bridge is a roller type instead of the more primitive earlier design where the strings went over a metal rod. The changer covers are the larger "ashtray" type with a Fender "F" logo. The scale is 23". Modern steels are usually around 25" and people will bag on the short scale instruments because of lack of sustain. I don't have any complaints so far on the sound. The remaining notable feature is the mute system on each neck. My specimen is missing the felt pads that sit in little cups between the bridge and pickup. A lever at the right of the ashtray covers raises the pads up to the strings. I haven't noticed any need for this and the pickup switch easily selects which neck you want to hear. It makes me wonder if they are really intended to be mutes or if there is some other purpose. I found one reference to them being used to alter the sound to sound like a dobro. This guitar has the stock 8 pedals but you will see some with 10 pedals. The manual gives instructions for shipping the guitar back to the factory to have these extra pedals added. The manual has a section at the end that lists all the chords you can make with combinations of the pedals. For a pedal steel this is a very simple instrument. The pedals each pull a rod down which pulls on a 90 degree lever bracket. A cable is attached to the other end of the lever. The cable runs thru a large multi-cable pulley. At the far end of the cable is a hook which hooks onto a changer. Very simple. There is adjustment at the foot pedal and at the lever bracket to adjust the slack in the foot pedal and in the cable. The changers have two adjustments (one for raise and one for lower). The adjustments are just machine screws on the right side of the instrument. There are springs which pull on the lowering portion of the changers to return the string to pitch. This is how the guitar came setup when I bought it. The front neck was conveniently set up to have the upper 8 strings of a 10 string E9 tuning. The E9 neck is not set up with a standard E9 string set. The strings are much thicker. I imagine this is due to the short scale (23" instead of the typical 24.5" - 25"). I think this is a good idea but I will need to build string sets myself out of singles. I found that D'Addario EXL110+ (.048 - .0105) electric guitar strings plus .042, .030, and .022 single strings are an economical way of replicating that set. According to a string tension calculator, this will result in string tensions between 35 and 42 lbs. 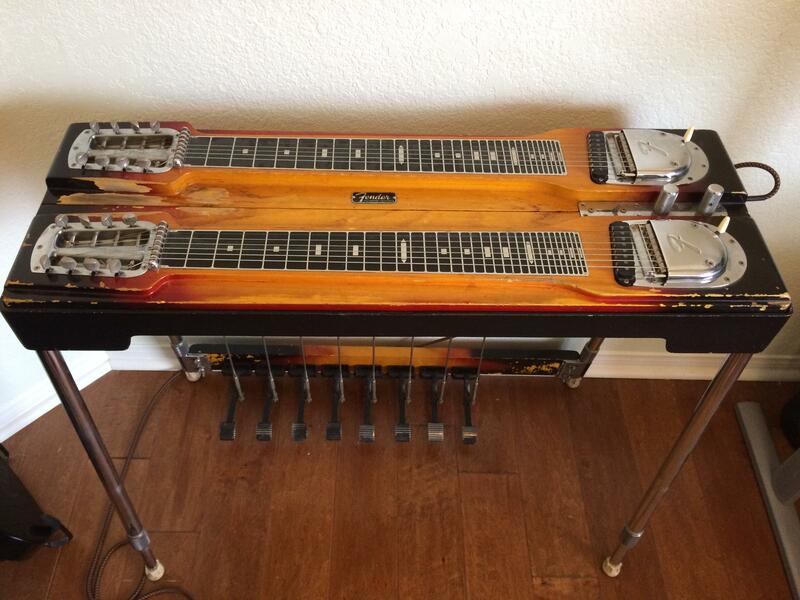 This is significantly higher than a standard scale pedal steel which should be more in the 23 to 28 lb range. This is pretty unusual. Why are strings 8 and 7 the same gauge? Why is the 1 string a heavier gauge than the 2? Why are 5 and 4 different gauges but tuned the same? The front neck was so deliberately set up that I have to believe this was too. It may be it was out of tune enough to confuse me.